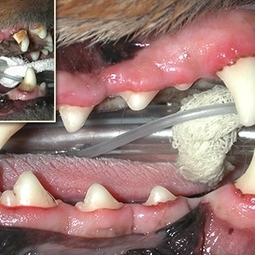 We perform veterinary dental care which includes routine cleaning, scaling, and polishing of the teeth. Healthy teeth and gums are just as important for your pets as it is for us humans. It not only improves breathe and whitens the teeth, but also helps prevent other health issues such as liver or kidney problems. The "before-and-after" photo (to the left) is an example of the amount of tartar/plaque and the associated gingiviits that can affect a pet's mouth and the beautiful photo "after" a good dental cleaning...Let us help your pet's smile shine.